Personally, the continuing state of flux in the media industry is a subject that really engrosses me. It’s something that I’ve been thinking a lot about recently, but haven’t really sat down to verbalise as eloquently as I’ve wanted. Om Malik, owner of Giga OM and a noted contributor to the future of media, collated some thinking on the future of media into an excellent post this week. Malik, in a similar vein to Rafat Ali of Paid Content and now Skift, or the Vox media group has built a future proofed media business – probably the most difficult thing to do in an era of journalistic uncertainty and reader attention deficit. In the piece, Malik gives an important of media as slightly different to the norm. It’s spurred me to put down a few thoughts on this notoriously debatable space. 50 or 20 years ago, the cost of a printing press would have prohibited even the most entrepreneurial media mogul. Back then, the big boys were newspapers, broadcast organisations and mass market behemoths. Companies with huge reach and a ‘cast the net wide’ focus. But that’s changed. In a world with less barriers to entry, the future of media won’t be based on rigid parameters such as ‘print’, ‘online’ or T.V. Similar to the concept of the ‘long tail of the web’ – the idea that there’s an easily accessible niche for all of us online, these brands will have a higher number of evangelist readers, a more clued in and attached reader base, albeit perhaps a slightly smaller one. The next great wave of media companies will be niche, brand driven and focusing on serving an interested community. Malik muses simply that “owning attention” and clarity about what your brand stands for will underpin success. Most publishing companies in particular cannot say what they are and what purpose they serve, so understanding what you are you doing and for whom should be a pre-requisite to success. At the moment, it’s the evangelised, high return visit sites like The Guardian, Daily Mail and NYT that are heading the market, albeit for various reasons. That’s a blueprint for the future. One thing’s for sure, things can’t continue as they are. Malik also makes the unarguable point that ‘stock-market trading or the sale of hotel rooms, the internet has a way of bringing deflationary forces to all businesses that were hitherto inefficient and involved many middlemen’. A sort of mirror to the industrial revolution in media. The “ruthless efficiency” of advertising on the internet: highly targeted demand. The endless inventory available on the internet: overwhelming supply. Now, display was supposed to be the holy grail for everyone. The ultimate saviour of media, a targeted, relevant and engaging ad medium for consumers, and, well, a targeted, relevant and engaging medium to buy for advertisers. Programmatic buying and a market flooded with supply means the CPM paid by a brand to an advertiser is decreasing almost daily. Meanwhile, display is seen by consumers as an increasingly irrelevant annoyance, as the emergence of ad blocking software will illustrate. Elsewhere, increasing mobile traffic and the ongoing issues with squeezing display onto a smaller screen only exacerbates the problems. Oh, and along with a lack of ROI on display because of low click rates and general disinterest from consumers, fake traffic, impressions and clicks are becoming common. 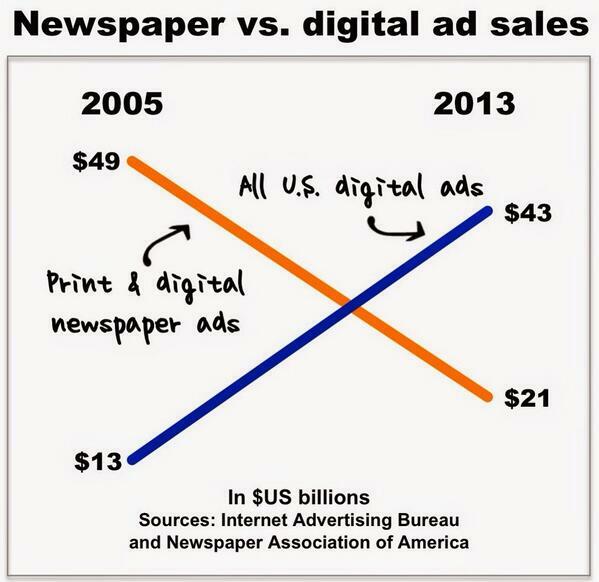 As per the graph on the right, advertising is still by far the largest revenue generator for the print industry, but the ad only business model is in a state of churn. Media brands need to find new streams to make up for declining circulation, print revenue and the dearth of digital display revenue to fill those holes. Not exactly the holy grail eh? For myself, but far more importantly for Malik and others like Frederic Filloux, it’s based upon fragmentation in revenue models and digital nativity. The financial support for journalism has become more complex and more varied. Witness BuzzFeed’s investment in original investigative and foreign reporting, Amazon founder Jeff Bezos’ purchase of The Washington Post, Vox Media’s capital investment in Ezra Klein’s explanatory journalism project, eBay founder Pierre Omidyar’s projected $250 million investment in the creation of First Look Media and Nate Silver joining ESPN. Much of this new investment is from people and organizations native to digital. They understand technology innately and succeeded there first, before moving into news. They also understand the need to be agile, to pivot and to find the correct revenue model for your brand, without being pigeon holed into thinking print advertising, digital display and circulation revenue is the only option. Media brands of the future will be built upon a core principle of agility, a fragmented model of multiple revenue sources, verticals, consultancy, research, events and online advertising. Other earned revenue streams—such as event hosting, marketing services and web consulting, could become a critical component to the broader, long-term picture. For now, these various streams remain small, accounting for about 7% of the whole according to Pew, but that’s set to change. A new ‘Media Revenue Matrix’ from Monday Note’s Filloux. As another noted commentator, Marc Andreessen states in a brilliant post on the issue, why shouldn’t a media brand be earning from conferences, premium accounts, relevant events etc. ‘The unique content proposition it enables multiple tiers of subscription revenue — daily, monthly, custom — as well as a product with deep user interaction that advertisers need to engage. It is an antidote to the tyranny of the pageview, with wider cross-functional appeal‘. Indeed, many smart larger and digitally savvy brands are already some way down this path, pushing towards a a business model that is less influenced by pure traffic figures. Creates events, awards, conferences and special branded reports along with a core business of online display and native advertising focused around digital marketing news. Also offers a consultancy arm. Along with display advertising, recent arrival Re/Code puts a major emphasis on events and will likely move into branded industry reports and research. One of the most open and forward thinking ‘traditional’ news brands, the Guardian has eschewed going down the paywall route in favour of a diversified portfolio incorporating native ads, events, training, recruitment and more. Wired has traded on its legacy to create a company which not only provides a print and online product, but also supplements its revenues with events, bespoke reports and consultancy services and a retail project. A blog turned news portal with an event and subscription based research business. A great example of finding a lucrative niche and supplying it, Skift is a travel intelligence media company that offers news, insight, data, tools and services to the travel industry. Skift is a media brand that sells intelligence and doesn’t silo itself into print, digital or anything else. Others include The Atlantic and Pando Daily. And it’s not just other media companies that are setting the trend. The new found, fragmented revenue stream theory for media is also being followed by brands. As ‘content marketing’ begins to become a key part of any brand’s strategy, we’re seeing retailers become publishers, brands creating print magazines, journalists becoming in-house content creators and P.R. 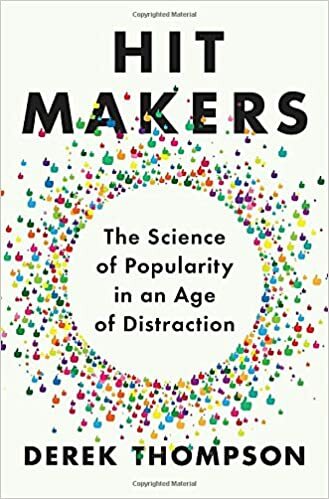 people become ‘content creators that tell other people’s stories‘ rather than communicators of other people’s content. Native advertising has also become an important buzzword for brands, with a focus on creating sticky, story driven content and placing it ‘natively’ into a publication or website. This is seen as more effective than heavily sales drive display. A print magazine focused on marketing and trends that’s rolled out into a consultancy, research platform and event curator. An e-commerce retailer and online content engine at the collision of tech and fashion that’s taking on Vogue with a new print magazine. Fashion blog turned online fashion retailer turned media company and now print magazine and event curator. The daddy of ‘content brands’, Red Bull is basically a publisher who happens to sell an energy drink. Creates startup incubators, music academies, documentaries, events, print magazines and online content. Meanwhile, thousands of brands like COS, Tesco, ASOS, Size?, Brown Thomas all create their own ‘branditorial’ magazines on a regular basis and host online portals of content created by bloggers and journalists. The lines are blurring, but that’s not necessarily a bad thing. This new found monetisation focus isn’t about contravening the unique morals and ethics of journalism, rather allowing journalists and editors to not exist in a silo any more, or perhaps forcing them not to. It’s about allowing, as Steve Hardy would say, creative generalisation. If we’re agreed that everyone, across all industries, is being forced to create more value in this post recession era, those within media should have an easier task than most – podcasts, curating events and research, creating conferences and consultancy should all come second nature. Oh, and print isn’t dead either, not by a long shot. While the new media revolution is digitally native, it shouldn’t involve being zealot when it comes to online. As we said above, niche, community based media entities have a unique opportunity to serve a highly engaged reader base. This opportunity manifest itself through beautiful print products. Ironically, the noise and buzz of online has burrowed a niche for narrative driven long form pieces.Elsewhere, legacy brands like Pando Daily, Politico and Grantland have also taken the leap into print, both as a brand building exercise but also an ancillary revenue generator. Taking football as a microcosm, the independent print revolution is growing in momentum. Beautiful, lovingly crafted publications like Green Soccer Journal, Blizzard, Eight by Eight and Rabona are supported by e-commerce stores and online advertising. These brands create a very specific high brow product with lots of revenue streams for a highly engaged community. Media is in an unprecedented state of flux. Media orgs must understand who their serving and how to build a brand. Digital nativity and thinking like a startup is a good place to start for legacy media brands. A fragmented model, encompassing many, some or all of events, consultancy, branded reports, display, circulation revenue, native advertising, video content, verticals is vital to success. Many brands are already aware of this, and have a head start. Traditional brands are blurring the lines in the media industry. Print isn’t dead, for some. 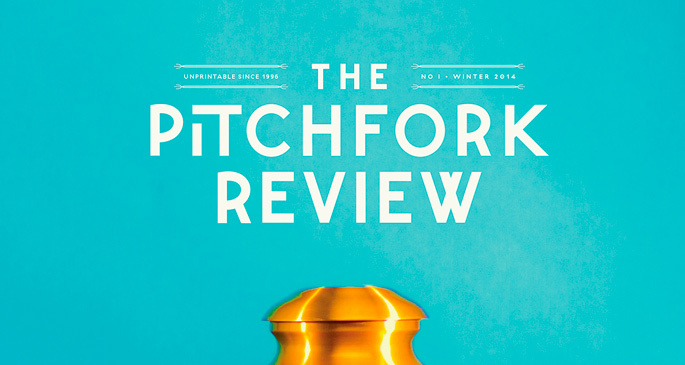 Creating a new media revenue model is a challenging, nuanced and often futile task. However, it’s certainly not impossible. With more agility, foresight and customer insight, Irish media brands can insulate themselves, gain a sustainable advantage over competitors and create a culture of agility and openness for journalists that will improve things for everyone. Key is adaptability, non-siloed, entrepreneurial thinking.